CookIslandsFootball.com > News > OFC Champions League 2019 > TUPAPA ON TOP AFTER ANOTHER WIN. TUPAPA ON TOP AFTER ANOTHER WIN. Tupapa Maraerenga after winning against Loto Ha’apai have booked their spots in the second stage of the OFC champions league which starts next week. 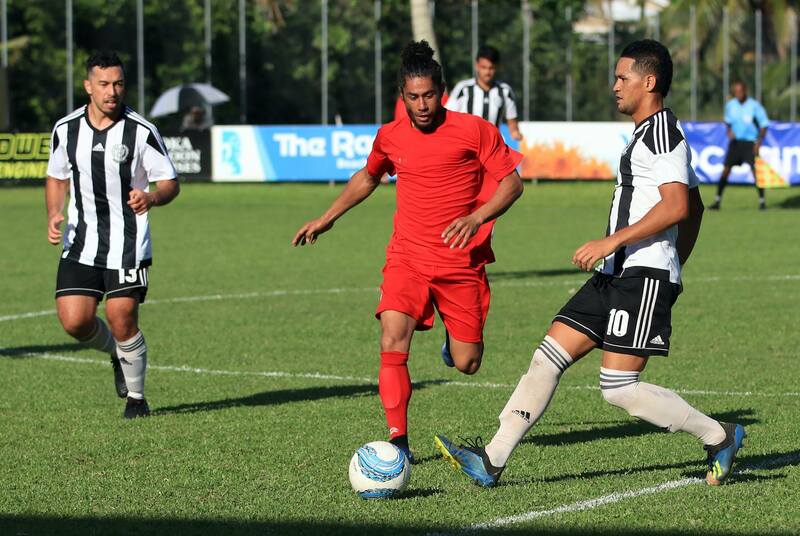 Meanwhile, Kiwi FC revived their chances at qualifying with a win, in a close encounter with Pago Youth FC. Pago youth FC put up a good fight against their Samoan brothers Kiwi FC in the opening match. The team which has not qualified for the OFC champions league in previous years, kept the score tight, while having minimal possession of the ball. The American Samoan Club went down however 3 goals to Kiwi FC’s 4. Their striker, number twelve, Palauni Tapusoa, earnt himself a hat-trick from several plays put in behind the opposition defense. Martin Tamasese, Kiwi FC’s coach, admitted his side had difficulties, saying “It was a tough game for us, the American Samoans knew our style of play and it was tough, but a win is a win and we are happy with what we’ve got today. “We were expecting a hard match like this and we had to try really hard but we knew we were fast and fit, but still it didn’t always work our way,” Tamesese said. In the second match of the day, Tupapa took on Loto Ha’apai in the contest for the top spot on the ladder. Tupapa came out on top four goals to one. Tupapa started off strong scoring the first goal in the first minute. From the kick-off, the ball was played into the middle of Loto Ha’apai’s territory where a cross was put in behind the defense for Jared Colligan to slide onto and place the ball into the net. Seven minutes later, a penalty was given to Tupapa where Ben Mata, who scored from a similar situation in Tupapa’s first game against Kiwi FC, slotted the ball into the back of the net for the second Tupapa goal. Tongan side Loto Ha’apai, turned up the heat by getting one back before the first half ended. After a word from the coaches, the second half got underway with a stalemate in the midfield. To sum up, Tupapa scored another two goals through the boots of Ben Mata and Grover Harmon, putting away their opposition. With Tupapa Maraerenga having booked their place in the next stage, the last spot will be determined on Friday between Kiwi FC and Lotoha’apai who will face off at 2:30pm. The last game of the qualifiers will be between Tupapa Maraerenga FC and Pago youth FC at 5:30pm at the CIFA Complex.